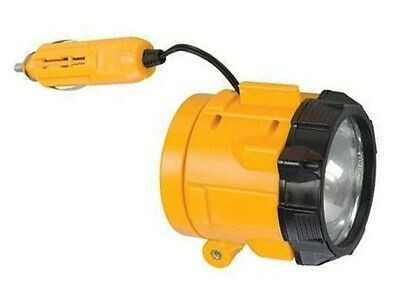 Magnetic Car Portable Spotlight Light Torch 12V, Night Reading Storage Torch U3 Watch this item.E-Mail a friend. Description Brand New Magnetic Car Spot Light , Spotlight with 0-180° adjustable magnetic base. Internal reel mechanism with 2.8m of 12V cable. Compact size for easy storage in glove compartment. 10W Spotlight output. Connects to a standard cigarette lighter socket. Shipping All orders placed before 3 PM are sent out the same day via Royal Mail / Courier Collection from our UK Based warehouse, We ensure items are packed with great care and arrive in a timely manner. Returns In the unfortunate event that the item received was defective or incorrect, Please contact us immediately so we can take prompt action in resolving the matter with you through the following methods: A replacement can be sent out urgently through careful staff quality control Alternatively a full refund can be made upon return of the item We Guarantee a 90 day return policy so please be assured that your transaction is fully protected within this timeframe.